The big players in the fast food industry have a long history of copying each other's menu items. It's just the nature of the biz, you might say. 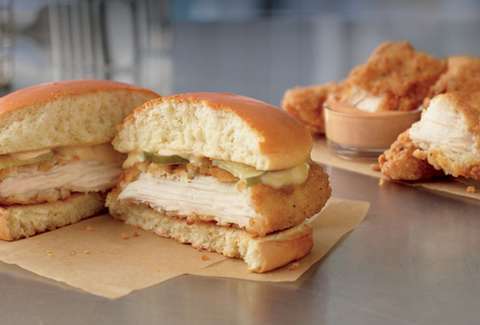 However, McDonald's appears to be making a pretty bold move with a new offering this week: a fried chicken sandwich that looks and sounds like a not-so-subtle knockoff of the iconic Chick-fil-A version, complete with a signature topping of pickles. Mickey D's is currently testing the made-to-order Ultimate Chicken Sandwich at more than 160 locations around the state of Washington, and it looks awfully similar to the cult-favorite chicken sandwich that made Chick-fil-A famous. Specifically, it features lightly breaded and seasoned all-white meat chicken topped with Sweet Dijon Sauce and pickles stacked on an artisan roll. But unlike the Chick-fil-A version, the one made by the Golden Arches comes with a mustard sauce and without a side of anti-LGBT baggage. Thrillist has yet to conduct a proper taste comparison. While the sandwich is currently only available in a very limited market, it's possible it'll make its way to more locations. That would likely be welcome news to frequent Chick-fil-A patrons looking to expand their horizons, and even more welcome news to many other people who love the taste of Chick-fil-A's sandwiches, but choose not to eat there for political or ethical reasons. If sandwiches aren't your thing, the chain is also testing some other made-to-order "Ultimate Chicken" offerings including Sweet N'Spicy Honey BBQ Glazed Chicken Tenders. So, if you know anyone in Washington, please ask them to buy the heck out of the new items so the rest of us might have a chance to try them.